This "combined" edition from the Foundation for Inner Peace is the only complete version that includes all of the writings that Dr. Helen Schucman, the Scribe of A Course in Miracles, authorized to be printed. It consists of a Text, Workbook for Students, Manual for Teachers, and Clarification of Terms. Also included are the supplements "Psychotherapy: Purpose, Process and Practice" and "The Song of Prayer," extensions of the Course principles which were dictated to Dr. Schucman shortly after she completed the Course itself. A Course in Miracles is a complete self-study spiritual thought system that teaches that the way to universal love and peace - or remembering God - is by undoing guilt through forgiving others, healing our relationships and making them holy. Emphasizing that it is but one version of the universal curriculum, it uses the language of traditional Christianity, but expresses a non-sectarian, non-denominational spirituality. Over 2-million English language copies in print. 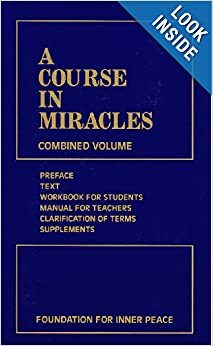 Unlike the readings mentioned above, A Course in Miracles is not to be read like a book. It is a Bible, so to speak. It should be read as mode read a Bible-more as a study. Just as A Course in Life, A Course in Miracles is just what it says-a course. It is a course in learning how to choose love over fear. And it is a process of learning to identify with your changeless eternal perfect self, instead of the illusory fear-filled personal self. A Course in Miracles allegedly was written by the voice of Jesus. It is not important whether you believe in Jesus or not. A Course in Miracles, and anyone associated with A Course in Life, is not in any way proselytizing any spiritual belief. This is simply an invitation to study and work through an extraordinary compendium that leads you to have a better more loving less fearful relationship with God, yourself, your brothers, and your inside and outside world. If it works for you, fine. If not, put it down. Or perhaps take what works and leave the rest, as we invoke you to do with everything in A Course in Life.